MiniScan MS12xx - Maximum versatility! FZY modules feature fuzzy logic technology for premium scanning on 1D bar codes, even those with poorly printed, low-contrast symbols. As a fixed mount scanner, the FZY modules are ideal for manufacturing, warehousing and shipping, conveyer belts, assembly lines, library systems and other applications needing reliable unattended scanning. The WA modules are ideal for OEM applications such as diagnostic equipment, medical instruments, kiosks, robotic equipment and lottery terminals. Enables a high first-time read rate, including poorly printed and low-contrast symbols. MS12xx FZY can scan from near-contact to more than 60 in (152 cm). MS1207WA accommodates wide bar codes at, or near, contact. Protects against water and dust, ensuring reliable performance in rough conditions. Toggles between internal or external beeper, depending on application. Offers flexible control of unattended or hands-free applications. 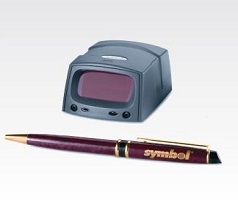 Provides fast, simple interface communication with advanced features and functionality. Enables creation of applications using Windows 98®, 2000, and XP platforms. Easy-to-use PC-based utility reduces end-user installation time.